Today we sit down with our first whisky from the Amrut Distillery for a ModernThirst review. Jeremy and I have both had the Amrut Fusion on multiple occasions. Our Proper Pour Whisk(e)y Club has tasted the Fusion on two separate occasions, both known and blind, and it comes in at a solid A- (91.3 overall) – in our top 30 out of nearly 260 rated whiskies. Jeremy loves the Fusion giving it a 97.5 (one of his all-time favorites). For me it comes in right around a 90. But enough on Amrut Fusion (quick plug – if you haven’t tried it you should) – this review is about a whisky, the Amrut Naarangi, that can best be described as different. You’ll see what I mean in the descriptions below. 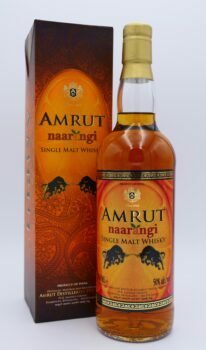 Amrut presents another first of its kind – single malt whisky finished in orange sherry cask. 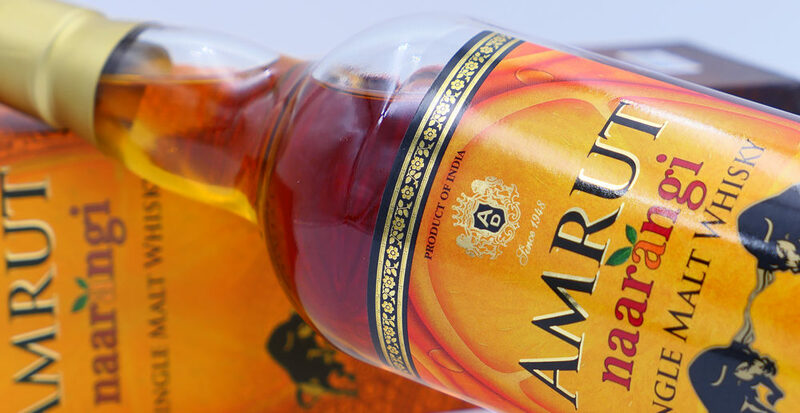 Amrut procured Oloroso Sherry from Spain and then infused the sherry with fresh orange peels for over two years. Then the sherry was emptied and filled with Amrut Single Malt [the website states three-year old whisky is put into the casks] for further maturation [indicates three more years on the website]. 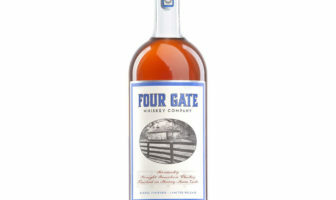 The result is an essay in elegance: notable yet not dominant orange sherry notes perfectly fused into the whisky flavor. Hence the name – orange in Hindi. Hmm. Orange peels soaked in sherry casks for a couple years then dumped as prep for finishing casks and then whisky added for another three years. This one has piqued the interest level. Let’s quickly touch on the basic stats and then get to the tasting notes. As always – the notes you see below were written and the bottle scored prior to any discussion by Jeremy and me of what we nosed, tasted, or felt overall, about the dram in consideration. 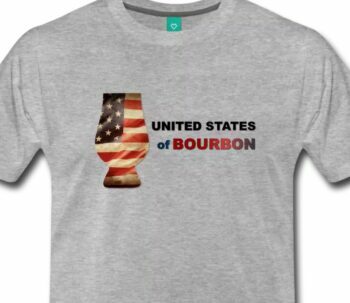 We have spent time with this whisky on multiple occasions. AMRUT NAARANGI: A different whisky – polarizing to some. After tasting at a local store, I had to add to the collection for the uniqueness alone. A pleasant change of pace – but the cost may be a bit high for what you get (WJ). Nose is the best part. I loved sitting and nosing this. Taste failed to live up to the nose, and I’m not a fan of the mismatch between the two. My one-word description – weird (JR). Amrut Naarangi is not a bad dram, but I also cannot say it is a really great dram either. Unique, yes that will work. I’d recommend to try before you buy – and if it fits your taste profile, or our descriptions do, then go for it. A different dram – so different that I’d recommend you try before you buy – or if you like orange and spice, or possibly want a whisky to challenge your whisky friends with, go for it.